Tell us about the concept behind Rebound Books? 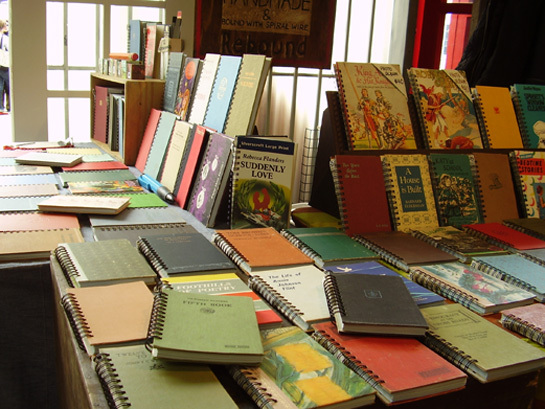 Rebound Books is about creating unique stationery in an environmentally responsible way. Everything we create is handmade. Our materials are second hand and otherwise likely to end up in landfill. 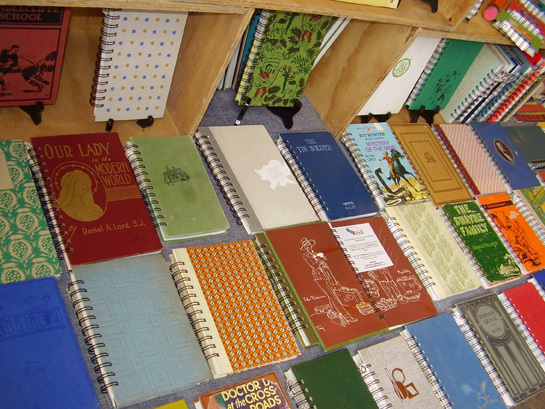 We began by using covers of old books to make blank writing journals filled with 100% recycled paper, including a few pages from the original book too. We developed the idea further and Rebound grew to include a range of photo albums using annuals from the 1950s and 1960s filled with an archival quality 100% recycled cardboard. 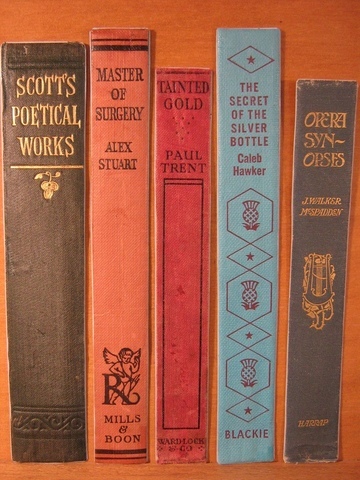 We had a box overflowing with spines from the books sitting in a corner of the workshop and it wasn’t long before we began to use these to make bookmarks. In 2007, after about 6 months of designing and planning, we launched our Little Golden Book calendar diaries with the entire story included to read across the year. Our most recent invention is our Record Cards, which we’re infatuated with! The Record Cards are handmade greeting cards made from second hand record covers and envelopes made from second hand sheet music. They’re rather cool. I grew up with a Useful Box in my house just like the one on Play School, and a very resourceful Mum. We spent cold and rainy days inventing all sorts of creations, using things that had already lived out their first life. Did you know there are one hundred uses for a cardbard toilet roll? It’s how I look at everything these days, and the question “What else can I use this for?” goes through my mind before anything goes in the bin, or even the recycling box. We apply that to Rebound by being constantly driven to improve the way we do things. We are crafty when it comes to using old books as materials for new creations, and whatever we can’t use is donated to local Melbourne artists. All our processes and machinery are manual and run on old-fashioned elbow grease. When did you start Rebound Books and what inspired you? It all started in 2002 when we discovered a shared love of op shops and old books. Over the ensuing years we amassed a collection of gorgeous hard cover books with witty or silly titles, delicate embossing or bold bright images. These books were not purchased for their contents, which were often out of date or badly damaged. We judge our books by their covers! It was late 2004 when Ben and I were planning an overseas adventure that we started looking for a travel journal to take with us. The search wasn’t fruitful, and we started dreaming up ways to make our own. We weren’t back in Melbourne long before we had the first of many conversations about how to reuse these books we kept buying that were sitting on our groaning bookshelves in the lounge room. We talked about exactly how we could use them to make something new and that’s when Rebound came to life. What was the most challenging aspect of establishing Rebound Books into a business? Initially it was both of us juggling day jobs as well as working evenings and weekends on making our Rebound goodies. Things have settled a bit since then, and we’re finding more and more time for Rebound in our weeks, but it’s still a tricky balance. Our business has been growing steadily these past few years. Personally for me, there’s an added challenge of wanting to keep every book we’ve ever made! I have a short stack at the moment of about 6 books I’m determined to hang on to, although the batch I’m about to make might find me letting go of a few of those to replace them with new ones! Why does coming to the Finders Keepers Markets in Sydney help a Melbourne based label like yours? Road trip! Plus we can display our wares to a new audience in Sydney, and best of all, some of our favourite op shops are on the way! Did we mention we love a road trip?! Where is your workspace and what is the atmosphere like? Our workshop is the spare room of our house. 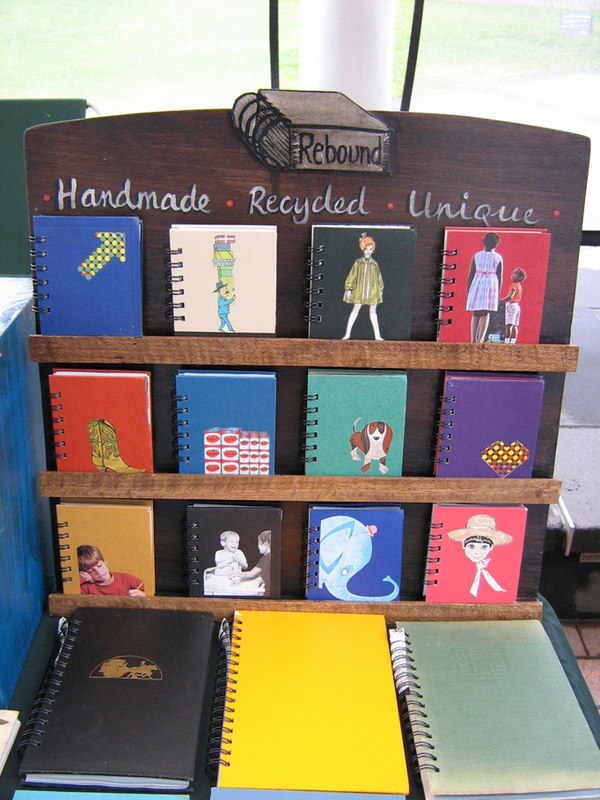 Rebound Books are homemade as well as handmade! It’s a very creative space with lots of work stations around the room and we’ve decorated the walls with with book pages and some of the interesting things we’ve found inside books! There are a few different types of manual machines along with other assorted tools scattered about the place. We seem to have expanded out into the hallway and some parts of our lounge room are also looking like Rebound work areas, so we might have to sit ourselves down and have the talk about moving out of home. What do you find most inspiring about living and working in Melbourne? I’m a Melbourne girl, born and bred, so loving this city is in my blood. Ben’s a country Victorian boy from the Great Southwest. He was born in Hamilton and then grew up in Port Fairy. I just called out to Ben and asked him this question and after a brief pause, he shouted down the hall, “The weather!”. I’m inclined to agree. What new things are you working on and what is in store for the future? We’ve just launched our new Record Cards so at the moment we’re making loads of them and creating some new shapes for the cut outs on the covers. We’ll spend some time very soon working on a new range of pocket books which will be super cute. We’ll also be starting work on our 2010 Little Golden Book calendar diaries, and they’ll be ready in October. I have an idea that I’m working on at the moment, but it will need some more development before it’s ready, and Ben always has a head full of ideas, so I’m just as keen as you to know what’s next for Rebound!